Greetings again from the darkness. Ambitious and mesmerizing. Those are the two words that best describe my reaction to this stunning film based on the David Mitchell novel. Hopefully, you have not come here for answers to the many mysteries offered up by this most unique film experience. If you are the type that loves to think, analyze and discuss complex movies, you will be challenged and satisfied. If you prefer your stories clean, straightforward and gift-wrapped, you will be like some of those in my audience who walked out of the theatre at various stages -not to return. While there are no easy explanations for what we see on screen, this is undoubtedly one of the more complex and multi-faceted and challenging movies to watch. There are six stories that span approximately 500 years (beginning in 1849 and going through 2346 or so). We see many actors playing multiple characters of various ages, crossing racial and gender lines depending on the specific story. We track the progression/regression of their souls through time. This will prove more challenging to you than it sounds on paper, as the make-up work is some of the most extreme ever seen on screen. Many will describe the film as messy or convoluted, but the argument can be made that those traits add to the fun. Certainly, this won’t be to the taste of most; however, if you thrive on life’s puzzles, the film will hit your sweet spot. The six stories are co-written and directed by Tom Twyker (Run Lola Run) and The Wachowski’s (Lana and Andy, The Matrix trilogy). These six segments are split evenly between the two director groups, yet then blend seamlessly thanks to the truly expert editing of Alexander Berner. You will recognize the influence and similarities of such films as Master and Commander, Cocoon, Silkwood and Blade Runner, as well as many others. Filling the costumes, donning the make-up and spouting the dialogue in manners that you often won’t recognize are such disparate actors as Tom Hanks, Halle Berry, Jim Broadbent, Hugo Weaving, Jim Sturgess, Donna Bae, Ben Whishaw, Keith David, James D’Arcy, Xun Zhou, Susan Sarandon and Hugh Grant. 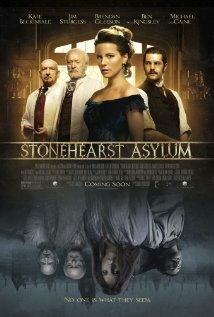 Especially entertaining are Hugo Weaving as a sadistic female nurse and Hugh Grant as a violent tribesman. The best laughs in the film are courtesy of the great Mr. Broadbent whose facial expressions are near clown-like in elasticity. As for the themes and points of the film, that is a topic for debate. A couple of lines of dialogue offer some clues. Hanks’ nasty ship doctor spouts “The weak are meat the strong do eat“, and we notice the recurring theme of the strong dominating the weak across all story lines. There is another line: “One can transcend any convention so long as one can conceive of doing so“, that provides the glimmer of hope in each story. Love and oppression are always present, but it’s clear to me that the human spirit remains strong and is capable of overcoming oppression in the past, present and future. You may disagree but our debates will be colorful … and may change after a second viewing!